Following a rigorous and lengthy tender process, Alert Piling Solutions Limited were appointed as the specialist contractor by the property developer, to construct a new build domestic dwelling in the highly prestigious Wentworth Estate, Virginia Water, Surrey. Our works involved initially with assessment of the overlying ground and instructing the developer to provide an adequate piling mat due to the soft ground conditions. Following on from this, we then installed 64 No. heavy wall tubular piles to depths of upto 13.0m to achieve the required SWL of upto 475kN. 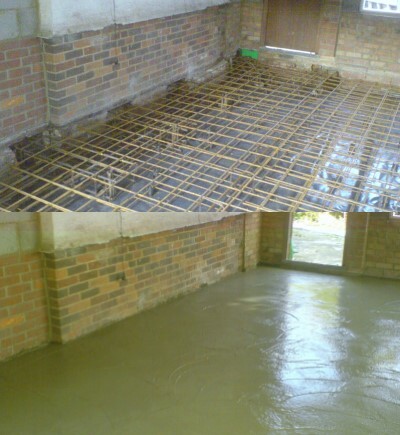 Upon completion of the piling element, 268Lm of 450mm x 500mm reinforced concrete ground beam were constructed above ground level and shuttered using the proprietary Pecafil system. The final element of our works was to lay the underbuild brickwork / blockwork and to design and place 155mm deep beam & flooring to the entire dwelling footprint. Alert Piling Solutions were awarded the specialist contract to carry out the construction of a lift pit for the Next Store, Fort Shopping Centre, Birmingham. Our works on site involved the floor saw, excavation of the pit, pre-augering the pile positions to a depth of 2.0m, driving 5 number 168mm diameter piles to depths of upto 5.0m. blinding concrete, waterproofing membrane, gas membrane, reinforcement, timber shuttering, casting the C35 concrete and striking the shuttering. The store was still open throughout the constructions of the lift pit so we carried out some elements of our works during the night to ensure no disturbance to the shop or the customers. All works were completed in 8 days. 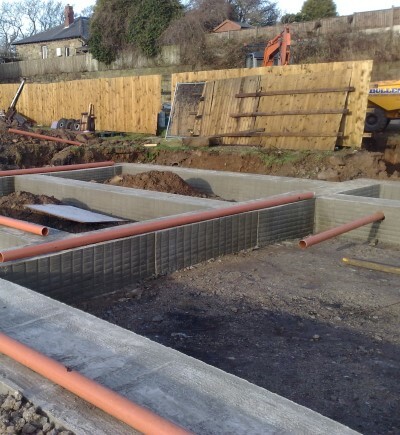 After selective tendering a Derbyshire building contractor placed the order with Alert Piling Solutions for the installation of the piling, ground beams and slab works for a new build property. Works involved the setting out of the pile locations and ground beam centre lines and installing 42 number 140mm top driven heavy wall piles to depths of upto12.0m, excavating and constructing reinforced concrete ground beams and concrete slab. All works were completed within 5 weeks. After been recommended by a local Architect Alert Piling Solutions were instructed to carry out the design and installation for a 5 bedroom new build property. Our works involved setting out of the pile positions and ground beam centre lines, installation of 47 number 140mm diameter top driven thick wall piles of loadings of upto 325Kn, upto depths of 12.0m. 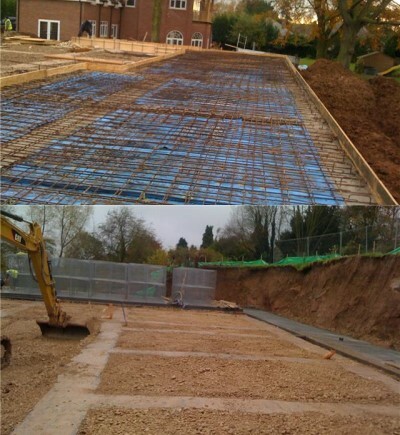 On completion of the piling we carried out the installation of the reinforced concrete ground beams, under build brickwork, block and beam floors and all drainage works. All works were completed on site within 6 weeks. Since completing this work we have been asked back by the client to complete a further two properties. After a long tender process Alert Piling Solutions were appointed by a property developer to construct a basement structure. The site involved a lot of access problems that we overcame. 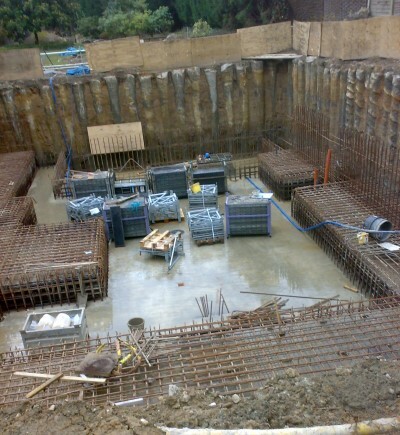 Works involved installing a contiguous piled wall involving 134 number 450mm & 600mm diameter CFA piles to depths of upto 16.0m, excavation to underside of slab construction, reinforced concrete slab at three levels with a swimming pool, reinforced concrete walls and pumping stations. All works were completed in 19 weeks. 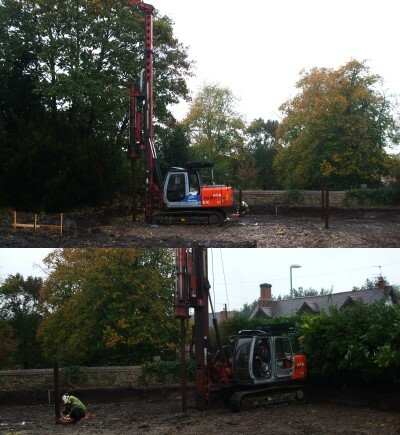 Alert Piling Solutions Limited were instructed via a local engineering practice to tender for the piling works to a new build six bedroom property. We were awarded the contract, which involved installing 38 number 220mm diameter bottom driven displacement piles to a SWL of 325Kn and to depths of upto 14.0m. During the construction of the piling works, the client asked Alert Piling Solutions to tender for the excavation and installation of the reinforced concrete ground beams as well as the drainage works. We were again successful in being awarded the works, which were completed in a total of 5 weeks. 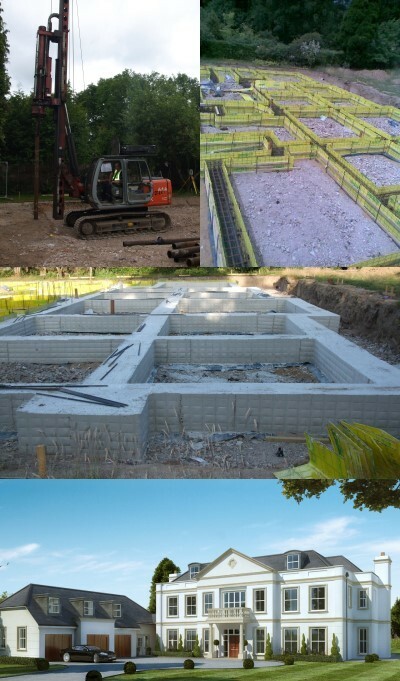 Alert Piling Solutions were awarded the contract to design and install 6 number new house foundations. Works included the installation of 132 number 150mm diameter bottom driven displacement piles of upto 7.0m, and construction of 6 number reinforced concrete raft foundations. All works were completed in 7 weeks. We were approached by a loss adjustor to design an underpin scheme to the left hand rear and gable wall. The cause of the subsidence was the failure of the existing drainage. The scheme involved replacing the existing drainage and installing 16 number 150mm diameter bottom driven displacement piles to depths of upto 8.0m with cantilever needle beams under the existing foundation. All works were completed within 2 weeks. Alert Piling Solutions were awarded the contract to design and construct a new build property by the home owner. 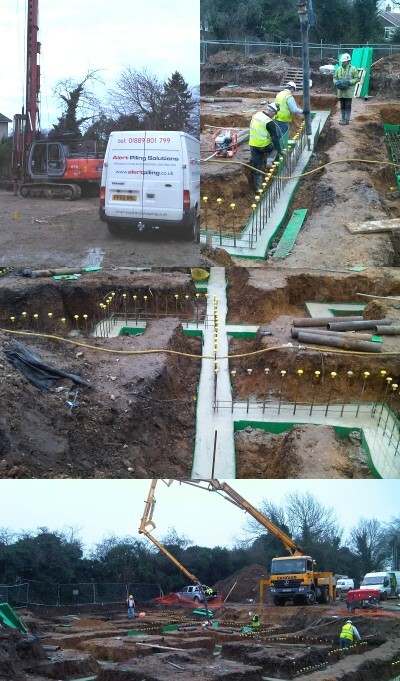 The works on site involved the setting out of pile locations and ground beam centre lines. Installation of 29 number 300mm diameter open hole augured piles with anti-heave precautions to a depth of 12.0m, excavate and construct reinforced concrete ground beams with full anti-heave precautions, under build brickwork, block and beam floors & drainage works. All works on site were completed in 6 weeks. Alert Piling Solutions were awarded the specialist contract to carry out reinforced concrete works to a marina. 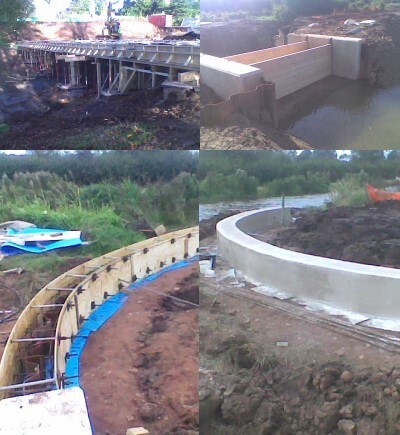 Our works on site involved curved reinforced concrete walls, water inlet structures, and a suspended reinforced concrete ground beam on concrete columns above the water. All works were completed in 22 weeks. We were approached by a loss adjustor to design a scheme to stabilise a double garage as the structure had moved because of ground heave. The underpinning scheme involved installing 26 number 250mm diameter open hole augered piles to depths of 10.0m, with 3.0m slip sleeve. Around the perimeter of the garage we installed 450mm wide by 300mm deep reinforced concrete needles beams into the existing brickwork. 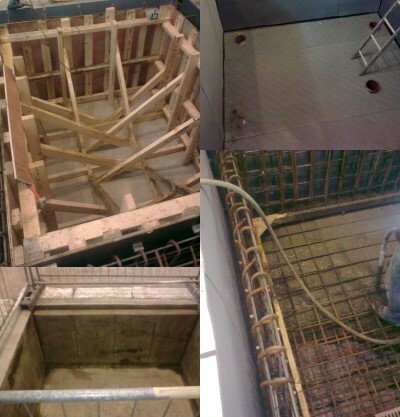 A 300mm deep reinforced slab was then be cast over the needles and tied into them to form the counterbalance required. All works had full anti-heave protection. Following a rigorous and lengthy tender process, Alert Piling Solutions Limited were appointed as the specialist contractor by the consulting engineer, to underpin an domestic dwelling on the beach at Camber Sands, Rye, Sussex. Our works involved initially with assessment of the ground conditions on the gable elevation. The existing foundation had dropped causing cracking in the gable brickwork, the foundation had been formed in the beach sand which had eroded by the wind. 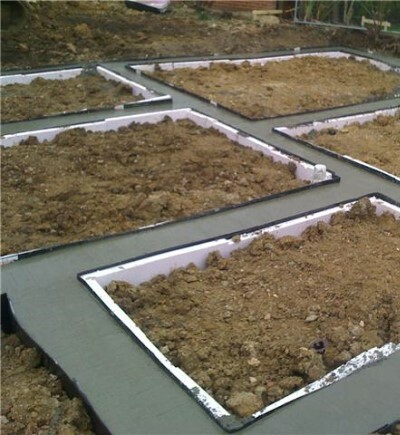 We than designed a vibration free solution that would not only underpin the foundation but lift it back to its original position. Following on from this, we then installed 5 No. 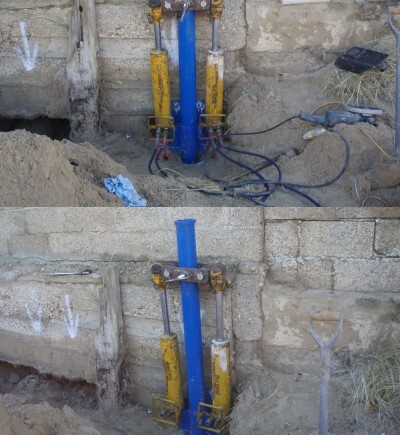 88.9mm heavy wall hydraulically driven jack down tubular piles to depths of upto 6.0m to achieve the required SWL and lift the existing foundation back into its original position. Following a lengthy tender process, Alert Piling Solutions Limited were appointed as the piling contractor, to construct a new build piled foundation for the forestry commission for a new cycle centre in Derbyshire. 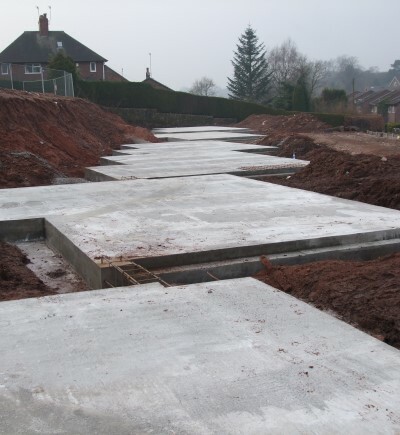 Our works involved initially with assessment of the overlying ground and instructing the developer to provide an adequate piling mat due to the soft ground conditions. Following on from this, we then installed 26 No. bottom driven steel displacement piles to depths of upto 9.0m to achieve the required SWL of upto 475kN. Upon completion of the piling element, 268Lm of 450mm x 500mm reinforced concrete ground beam were constructed above ground level and shuttered using the proprietary Pecafil system. Alert Piling Solutions Limited were appointed as the specialist piling contractor, to construct five new build piled foundations for a development in Brampton. This development had a restricted site access off the main high street in Brampton which we had to overcome. Our works involved initially with advising the client on the correct piling platform to carry the proposed piling rig. Following on from this, we then designed and installed 78 No.140mm top driven thick wall steel displacement piles to depths of upto 9.0m to achieve the required SWL of upto 295Kn in compression & 10Kn in sheer, inclusive of dynamic pile testing and vibration monitoring. Upon completion of the piling element, 228Lm of 500mm x 500mm reinforced concrete ground beam was constructed with starter bars left out in areas for a retaining wall element. 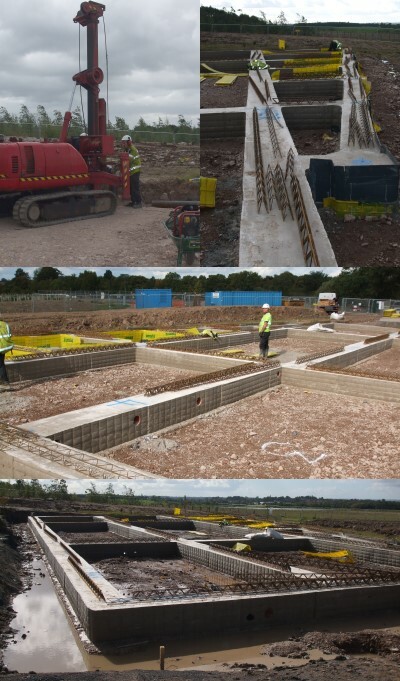 The setting out of the piles, ground beams & brick work corners was also carried out by Alert Piling Solutions to enable the brick layer to commence with the under build brickwork on completion of our works. 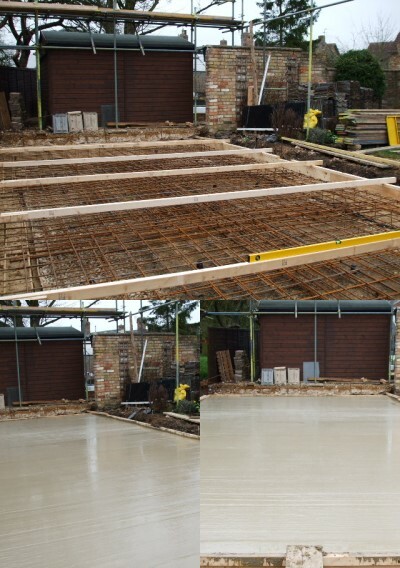 Alert Piling Solutions Limited was appointed as the specialist piling contractor, to construct a new piled slab with a step edge foundation for a double garage. Our works involved initially with advising the client on the correct piling solution for this project. Following on from this, we then designed and installed 12 No, 150mm bottom driven steel cased displacement piles. Upon completion of the piling element, 45M2 of 250mm thick reinforced concrete slab was constructed with a step edge ground beam. 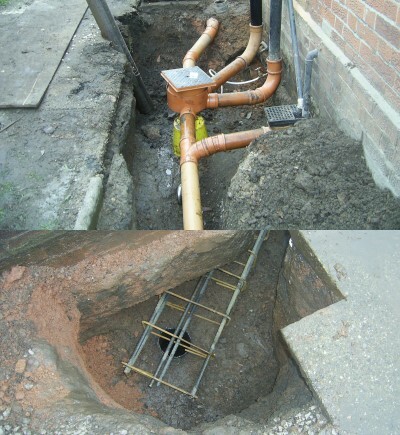 The setting out of the piles, ground beams & brick work corners was also carried out by Alert Piling Solutions to enable the brick layer to commence with the brickwork on completion of our works.